Turgeniev is best known for her exceptional engraving work on the coloured windows of the first Goetheanum building in Dornach, Switzerland. She was in close contact with Rudolf Steiner from 1912 until his death in 1925, and her unique reminiscences of this period are written from a Russian perspective, giving them a special flavour. 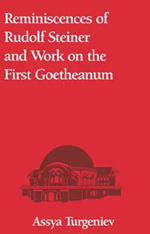 She provides eye-witness reports of the burning of the first Goetheanum, the time surrounding the death of Rudolf Steiner, the early performances of his Mystery Plays, Steiner's lecturing and travels abroad, the artistic work on the Goetheanum, the carving of the 'Group' statue, and the Christmas plays and Faust. She also describes the development of eurythmy, and recounts her memories of Marie Steiner, Edith Maryon and others. ASSYA TURGENIEV was born in Russia in 1890. As a child she already had the conviction that reincarnation was a spiritual truth. This was confirmed to her when she encountered the inspired ancient art at the Louvre in Paris at the age of 15. But it was only 7 years later that she encountered her spiritual teacher, Rudolf Steiner, through his books. She finally met him in person in 1912, while in her early twenties. Turgeniev spent many years at the Goetheanum in Dornach where she was a key pupil and co-worker of Steiner. She was married to the writer Andrei Byely.